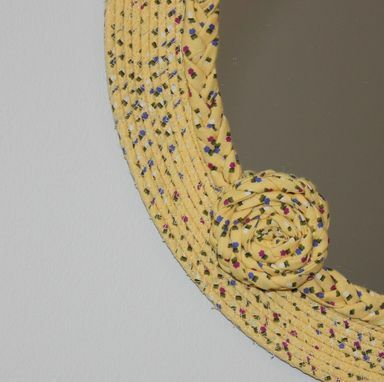 Wall Mirror - Fabric Wrapped Clothesline - Very Unique! Beautiful, well crafted, mirrored wall hanging. 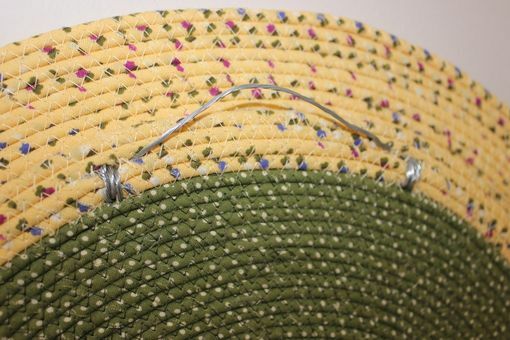 This wall decor was designed and constructed by handwrapping cotton clothesline in strips of carefully selected fabric. 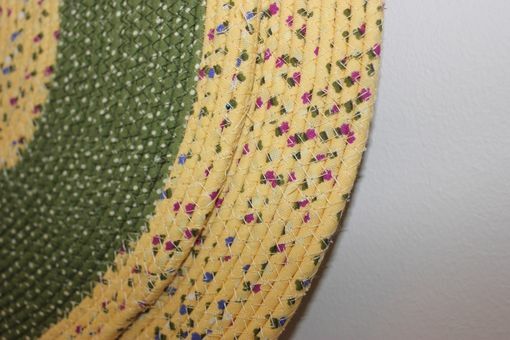 The wrapped rope is then machine sewn with a zigzag stich to form the outer portion of the wall hanging. 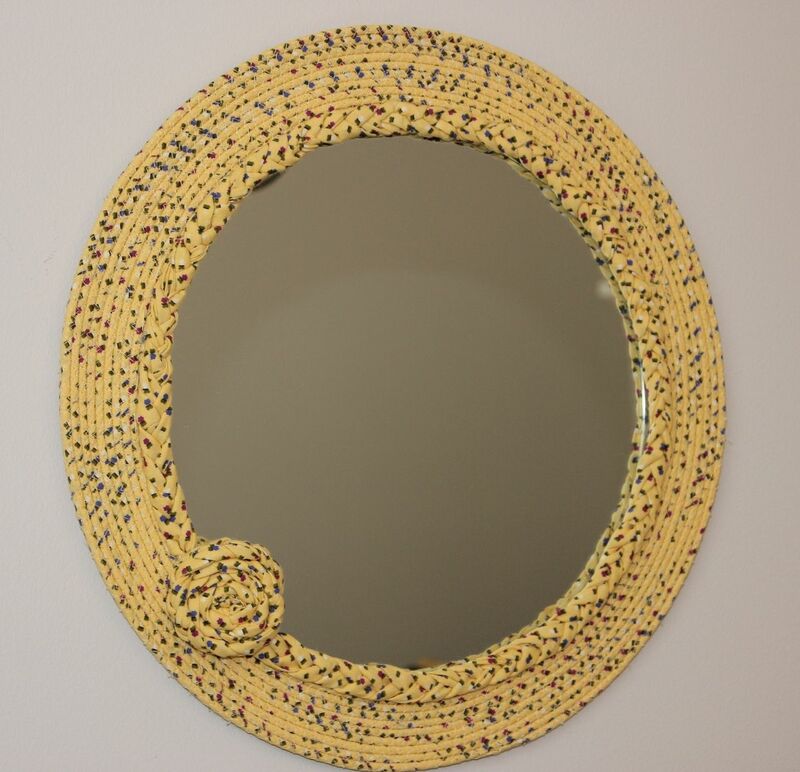 There is another round circle on the backside of the wall hanging to provide additional support for the mirror. 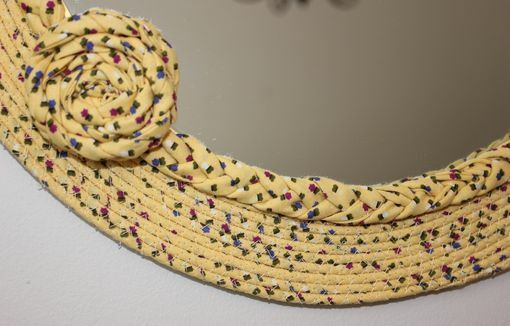 There is a braided rope made from the same fabric secured where the mirror meets the outside rope. Accented with a rosette in the same fabric. Hanging wiring hardware is secured to the back for wall hanging. Colors: Creamy yellow with splashes of rose, green and blue. 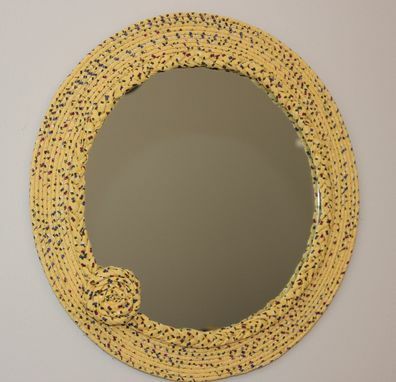 Dimensions: Mirror is 11.5 inches in diameter. 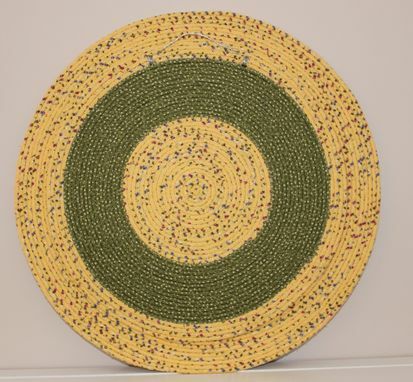 Entire piece is 16 inches in diameter. Outer edge of wrapped rope is 1.75 inches. Braided accent is .75 inch in width. BACKSIDE: the second circular piece on the backside measures 13 inches in diameter. Care: Can be spot cleaned with mild detergent and warm water. Custom orders are encourage to match color decor. Designs can vary depending upon needs of customer. Ask about matching pieces; serving bowls, lazy susans, center pieces, placemat sets.